The main focus of this stage of my OCA Textiles 1 course is tapestry weaving. There are several exercises, leading up to a resolved sample. The first is to try out different techniques. I used Kirsten Glasbrook’s book Tapestry Weaving which has a lot of hands-on information and excellent photos of various techniques to build into a sampler; and a book by Nancy Harvey, also called Tapestry Weaving, which goes into much more detail but is not so clear visually (at least not for me because I find it easier to see what’s happening from photos than diagrams. If you’re the other way round, the Harvey book has lots of good diagrams). 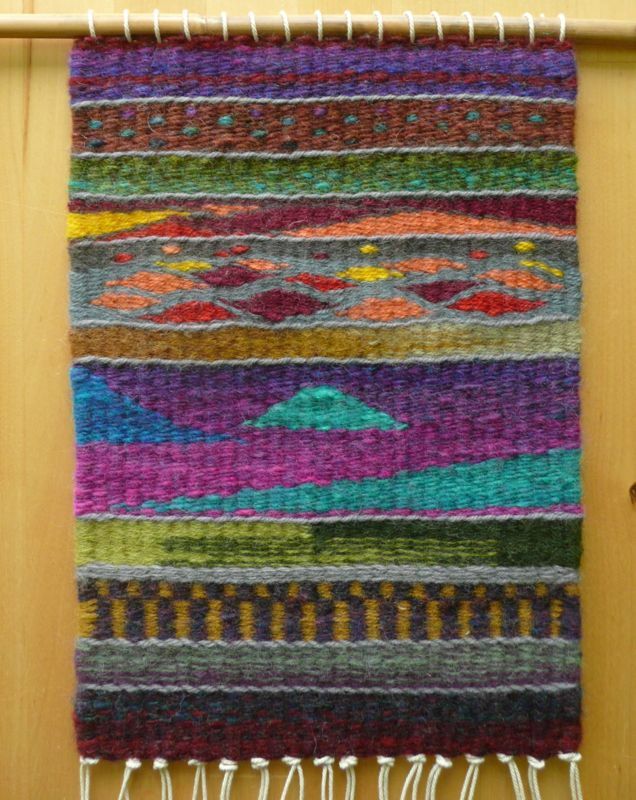 This is my first sampler, trying several different techniques, and a limited range of yarns – some plain tapestry wools (not rug yarn but the kind sold for needlepoint) and some Noro yarn. I’m trying to use up some of the materials I have already, to overcome a bad habit of always feeling I need the ‘right thing’ to hand. The next exercise was to create something expressive using a range of different materials; I was thinking fire or more specifically ‘deep into his fiery heart, he took the dust of Joan of Arc’ (from a Leonard Cohen song I’m listening to a lot right now). 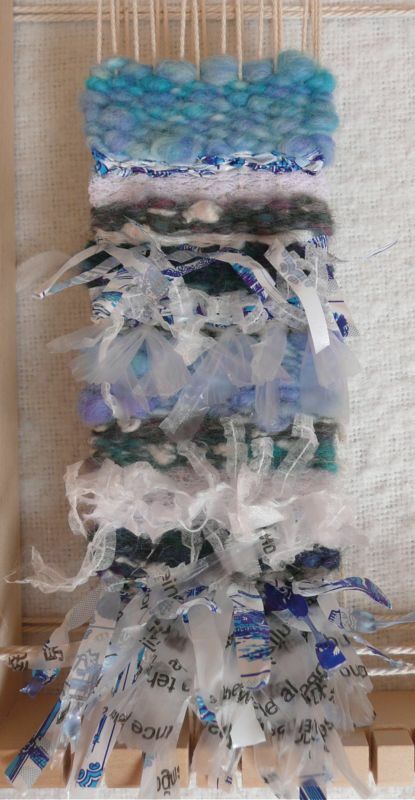 This one includes combinations of fibres and found materials – sari ribbon, embroidery threads, polythene bags and plastic netting, video tape, wire, handspun yarn, cord, torn fabrics, net, beads, knitting yarns and tapestry wools. I’m noticing I lean towards working on quite a fine scale. The third exercise was to use rya knotting in addition to the tapestry weaving, to create texture. Again the scale is small, and this uses handspun, plastic bags, net, silk and novelty yarn, inspired by the sea. The final sample involves choosing a word from a list and working a sample based on a storyboard. At least, they call it a storyboard but that means something different to me – I think what’s wanted is what I think of as a design board. I chose the word ‘sacred’ and as I’ve recently been reading Kathleen Norris’s ‘The Quotidian Mysteries: Laundry, Liturgy and Women’s Work’ that seemed like a good place to start. Clothes lines led on to prayer trees and also reminded me of this TIF Challenge piece on memory. 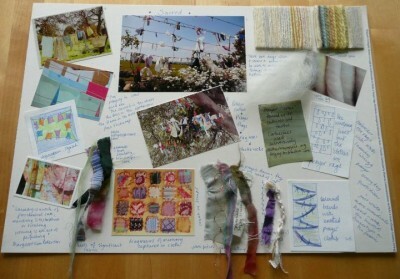 Here’s the design board – the weaving is still in progress. Your weaving samples are glorious, as is your design board. Thank you for sharing your work. 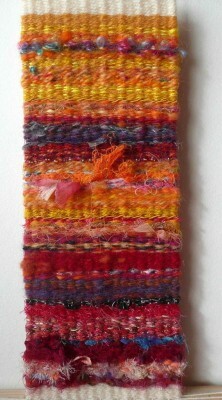 Lovely weaving, I realy like the ‘fire’ sample, great colours & textures. Looking forward to seeing your ‘sacred’ sample. Gorgeous samples Fiona!The flowing shapes of the first, the hot colours in the second and the lovely loose wave like textures in the third. Looking forward to the “Sacred” sampler! I just bought Glassbrook’s book, myself, and your sampler turned out really well. I like your other samplers, too. The story/design board idea is a good one. Thanks for posting! Yes indeed – in fact I mentioned it in the post! It’s a lovely book, isn’t it.